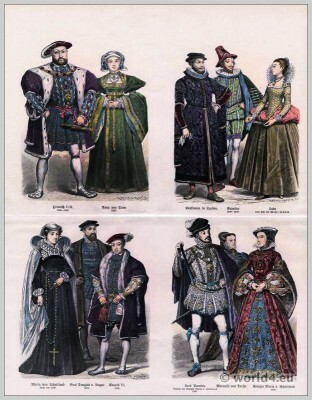 Tudor fashion in the 16th Century. Home » Tudor fashion in the 16th Century. Top row left to right: Henry VIII, Anne of Cleves. Right: Clothing of a merchant in London. 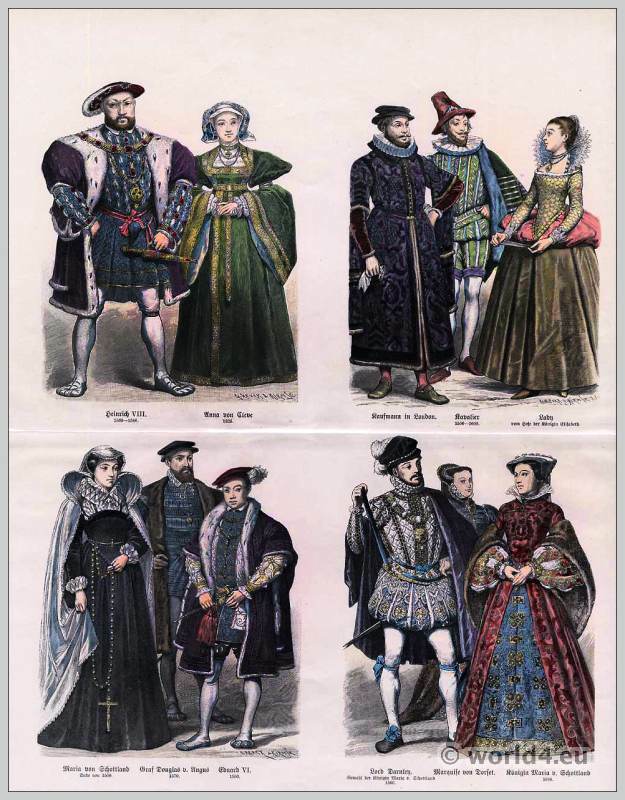 Cavalier clothing between 1550-1600. Clothes of a lady at the court of Queen Elizabeth. Bottom row left to right: Mary of Scotland. Douglas Earl of Angus. King Edward VI. Right: Lord Darnley, consort of Mary Stuart, Queen of Scotland. Marquess of Dorset. Mary Stuart, Queen of Scotland. Gallery: On the history of costumes. Münchener Bilderbogen. Edited by Braun and Schneider 1860. Mary Stuart receiving her death warrant. French lady costume at the court of Marie Stuart. This entry was posted in 16th Century, Court dress, England, Nobility, Renaissance, Tudor and tagged English history, Münchener Bilderbogen, Renaissance fashion era, Tudor period on 1/10/14 by world4.